It appears that one of my pre-new year’s resolutions is to throw my weekly standards out the window. No more chicken Monday, giant-bowl-of-food Tuesday, Chinese Sunday, and meatless whenever! Much like our deplorable “unpresidented” soon-to-be president, I shall keep everyone guessing about what is happening next. This is a delicious vegan meal. It’s good to look at and good to eat. While I try to keep the whole day meatless, I am much better at keeping it vegetarian rather than vegan. I ate toast with butter for breakfast, lentil soup for lunch with half of a mayo, lettuce, and tomato sandwich, and then the celletani for dinner. 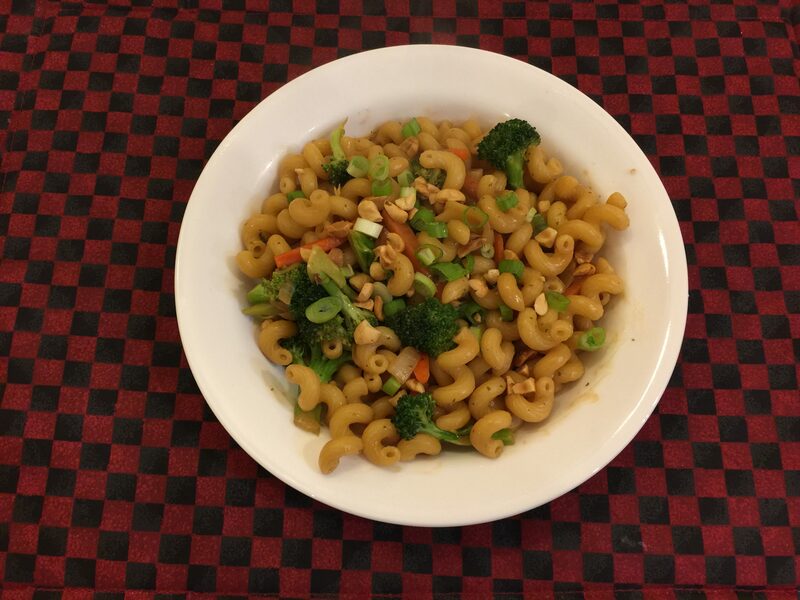 This entry was posted in Pasta, Vegan, Vegetables, Vegetarian and tagged broccoli, carrots, garlic, Onions, pasta, Peanut sauce. Bookmark the permalink.